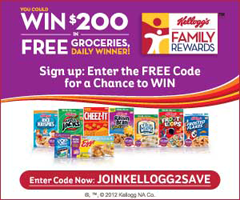 To Get FREE Kellogg’s Family Rewards 20 Points Sign-up or Login. Below are the current available codes that are still available. -Also be sure to keep checking this post for all of the latest updated codes. KFRSHARETHANKS20 = 20 Points (posted on 1/2) -Thank You, Linda! From time to time they will also email out bouns codes. You can also purchase specially marked Kellogg’s Family Rewards products like cereal, crackers, and snacks (participating products and their point values) and enter the 16 digit code found inside the item to earn points. Thanks! Between this and the contest I’ve got 550 points. I’m hoping they some swanky stuff. thanx h4f!I just ssigned up about 2 weeks ago and I’m almost at 1000 pnts! Thanks! Up to 1090 points. Takes way over 2000 to get something nice though. They’re hot for Delta: ENTERDELTASWEEPS also worked. How do you Enter the code you have on you’r Kelloggs cereal box online ??????? Thanks- 200 more points and I’ll have 2,000! There is also bonus 200 pts for Kellogg’s® Frosted Mini-Wheats® and +500 for Kellogg’s® Pop-Tarts® Sugar Cookie or Gingerbread! Look for the Kellogg’s Family Rewards logo on the box. If the box does not have the logo … 98% of the time … there will not be any codes inside. I only learned this after purchase many items without the logo and wondering the same thing. Hope this helps Betty. Only the 2013KFRBonusCode – 50 points (Added 2/19) seems to be working now, at least for me. I wonder if there is an easy way to make up codes…. If you think about it, all of the boxes that have codes are already sitting in the market. Its not like they activate the code after the box is sold, they are just waiting to be used. If someone could hack the system there could be an infinite amount of codes. EASTEREGGHUNTFUN is expired. Just wanted to let you know.